Sudden torrential rains, a phenomenon associated with climate change, cause a heightened risk of flooding and landslides in the densely populated communities on the outskirts of Caracas. CARACAS, Jun 25 2013 (IPS) - “The river is reclaiming its place, the water has risen up to here,” says Ana Polanco, crouching down to hold her hand high above her head in the little tin house she shares with her children in El Hueco, one of the communities on the east side of the Venezuelan capital besieged by the polluted and deceptively calm Guaire River. Stretching a total of 72 kilometres, the Guaire crosses Caracas from west to east in an almost straight line, but as it leaves the city, it begins to snake along a series of hairpin curves. 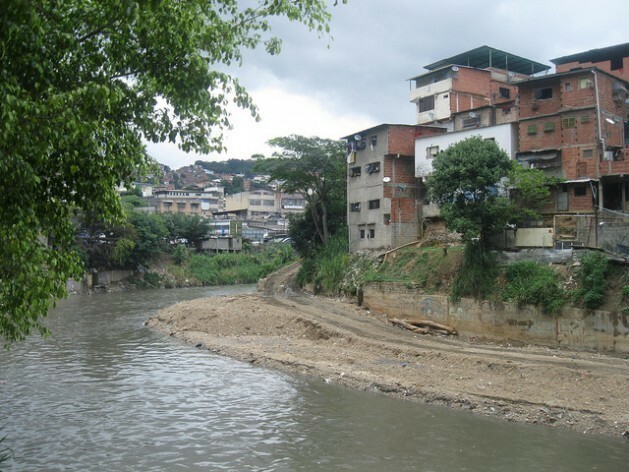 For the past quarter of a century, the flooding of this section of the river has wreaked havoc in neighbouring communities such as La Jóvita, La Línea and El Hueco, which sits at the bottom of a hill carpeted with precarious housing. Residents and local governments are making preparations to confront the dreaded “new rains”, which cause landslides that block the channels and ravines that would otherwise help to drain the swollen river. Further aggravating the situation are the tons of liquid and solid waste that flow into the river from homes, businesses and industries in this city of almost five million people. The “new rains” are “associated with climate change: during most of the 20th century, rains fell little by little, slowly increasing and then diminishing, but now they are short-lived and intense,” explained Nicola Veronico, the manager of environmental affairs at the Metropolitan City Hall of Caracas. “The same amount of rain that used to fall over the course of weeks or a month can now fall in a single morning. It only takes two hours of torrential rain for the Guaire to overflow,” Gabriel D’Andrea, the director of Civil Protection in the populous Caracas municipality of Sucre, told Tierramérica. One of the natural physical changes associated with the phenomenon of climate change is precipitation, “not only average precipitation levels, with the passage of the years, but also the degree of variability,” stressed María Teresa Martelo, a Venezuelan climate expert and member of the Intergovernmental Panel on Climate Change (IPCC). The eastern side of the city was hit hard in 1979 by heavy rains and the subsequent flooding of the Guaire River, in large part because of the lack of maintenance of drainage systems. It was also pummelled in August 1993 by Tropical Storm Bret, which ravaged northern Venezuela and Colombia, southern Nicaragua, and several southern Caribbean islands. In Venezuela, Bret left 150 dead, 77 of them in Caracas, in addition to 500 injured, as well as tens of millions of dollars in damages. It also sent a troubling message: that due to the effects of climate change, the tropical storms that regularly sweep through the Caribbean can take significantly more southerly courses than normal. “We don’t need another Bret to be worried and on the alert. People here already know that when it’s raining around Las Adjuntas and Los Teques (towns near the Guaire’s headwaters), they have to get ready to move to higher ground,” Henry Hernández, a community leader in La Jóvita, told Tierramérica. Hernández is one of the mechanics who works on the road that is separated from the Guaire by a containment wall. As well as holding back the river’s water, the wall also has markings used to measure its level. When it floods, “the river reverses the course of the water that flows into it from gutters, drains and sewers, which mixes with the river water and flows back towards the streets and houses, inundating everything and damaging whatever is in its path. People’s lives are saved, but we all have stories about the things we have lost,” he said. The Metropolitan City Hall operates a rain gauge station and monitors hundreds of storm drains and 350 ravines, many of which flow down from El Ávila Mountain, which separates Caracas from the Caribbean Sea, as well as issuing guidelines to the five municipalities into which metropolitan Caracas is divided. But “beyond these weak umbrellas, what is needed is the political will to address the root of the problem, because land zoning and land use tend to be viewed solely in association with the economy and divorced from the environment,” said Evelyn Pallotta, director of environmental affairs in the state of Miranda, which includes the east side of Caracas and most of its bedroom communities. The national Ministry of Environment has launched a plan to dredge the Guaire, whose waters carry large amounts of sediments as well as tons of garbage, from small plastic containers to rusted machinery. This would serve to lower the level of the river bed, which is one of the factors that contribute to its flooding when there are sudden heavy rains. “If you know that you can’t build on the banks of the Guaire, that you need to leave a green strip up to dozens of metres wide for safety reasons, then you shouldn’t allow housing, industry or businesses there. The solution has to be structural,” she told Tierramérica. Polanco, who lives in one of a string of small houses separated from the river by a narrow corridor of concrete and dirt, agrees with Pallotta. “Yes, the solution would be a plan to provide housing for all of us far away from here, but so far we have only been counted in the census,” she commented, referring to a census of families needing homes conducted by the government as part of the Housing Mission, aimed at tackling the critical housing shortage. The heavy rains also pose a threat because of the risk of landslides in a city full of hills and hollows, much of it covered with metamorphic soils that have endured decades of punishment from vertical construction. Since the launch of the Housing Mission two years ago, the national government has built hundreds of apartment buildings in former empty lots, industrial areas and parking lots in Caracas. Although this construction has provided urgently needed housing, there have been complaints of overcrowding, poor service connections, improper waste disposal, a lack of green areas and water treatment plants, and excess traffic.